Sara Genevieve (Ward) Norton was born April 16, 1926 to Charles Floyd Ward and Mary Catherine (Rogers) Ward in Cement, Oklahoma. Genevieve passed away on Tuesday, January 8, 2019 at the age of 92 at Purcell Municipal Hospital, Purcell, Oklahoma. She was a member of the Bethel Baptist Church in Anadarko. Genevieve graduated from Cement High School. She and Floyd F. Norton were married on April 8, 1945 at the Baptist Church parsonage in Cement, OK. During their marriage they moved to Pampa, TX where Floyd worked for Halliburton. They moved back to Cement and transferred to Anadarko in 1954. 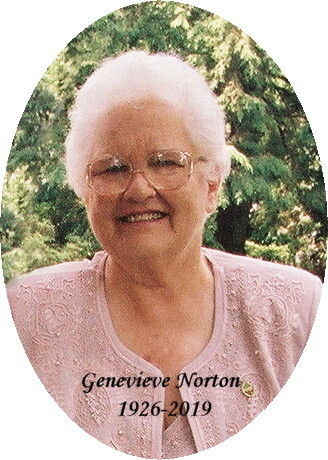 Genevieve worked at Peck’s Red Bud Grocery, and later she worked at Western Farmer’s Electric and baby sat with many children. Survivors Include: Three sons, Lee Norton and wife Joy of Hinton, OK; Kevin Norton and wife Cheri of Alexandria, LA and DeWayne Norton and wife Kim of Purcell, OK. Eight grandchildren Kari and husband Brent Tucker of Hinton, Okla; Kristi and husband Marty Chance of Yukon, Okla; Jeremy Norton and wife Laura of Edmond, Okla.; Joshua Norton and wife Suzanne of Okla City; Caleb Norton of Seattle, Washington; Sarah Norton of Ruston, Louisiana; Chad Norton of Purcell, Okla.; Josiah Norton and wife Audrey of Norman, Okla. Twelve great grand-children and one great great grandchild. She was preceded in death by: Her parents Floyd and Mary Ward, husband Floyd Norton, brothers Thieman Ward, Floyd Ward, Harold Ward, Kyle Ward and sister Eula May Ward. In lieu of flowers you can make a donation to the Lottie Moon Mission, International Mission Board, 3806 Monument Ave. P.O. Box 6767, Richmond, VA 23230-0767 or to the Gideon’s International, P. O. Box 140800, Nashville, TN 37214-0800. Services: Friday, January 11, 2019 at 1:00 p.m. at the Bethel Baptist Church, 503 Florida Ave, Anadarko, OK.
Services entrusted to Turner Funeral Home, Hinton, Oklahoma. Condolences may be sent to the family atturnerfuneralhomes@gmail.com, or you can find us on facebook.com (Turner Funeral Homes).